I've been surfing the pier for 40 years, have been an ocean lifeguard and like many of you have pulled many swimmers and surfers out from under the pier. Unfortunately, the pier's popularity as a tourist destination warranted the addition of lifeguards for public safety. Concerned about not being able to surf the pier again, I decided to become more directly involved. On Tuesday afternoon, April 11th, Cocoa Beach City Commissioner Tony Sasso and I met with Wyatt Werneth Brevard County head lifeguard, down on the beach at the pier. 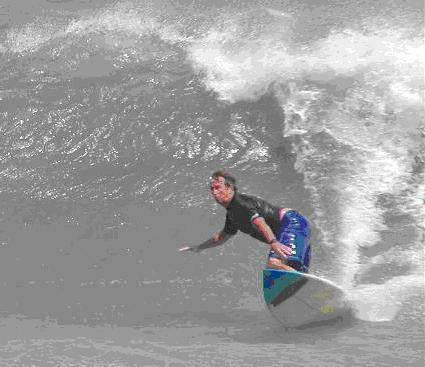 The wind was howling out of the NorthEast (one of my favorite times to surf those rights on the south side). I was able to voice my concerns as a surfer who has enjoyed pier waves for 40 years... and I listened to the rules the lifeguards established. I don't want to loose our surfing privileges, but understand the need to protect swimmers. I don't see how we could have prevented pier lifeguarding from eventually becoming a reality. 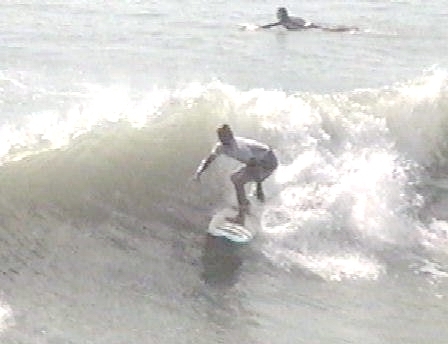 My immediate concern was the fear of being denied the right to surf there on a primo pier day. Note the candy-stripped painted pole. 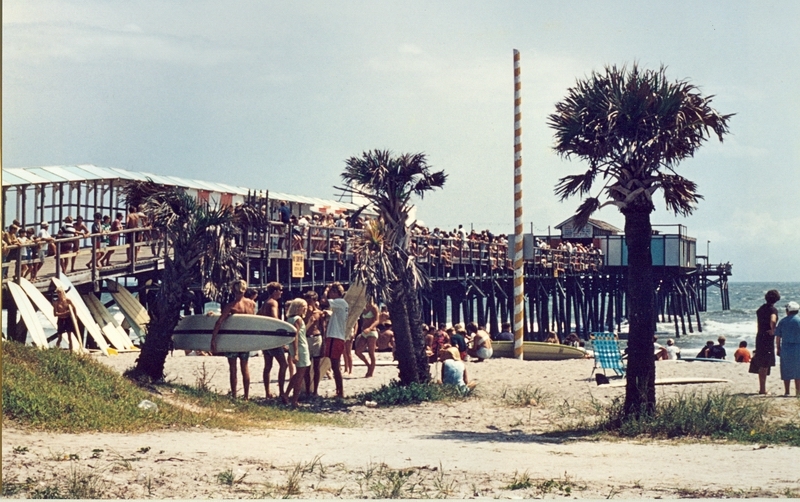 During this era, surfing was not permitted between the pole and the pier. The rule was impossible to enforce and the City eventually gave up on the idea and had the poles removed from the pier and from other locations along Cocoa Beach. Lifeguards may determine that one side of the pier is unsafe (usually do to sideshore winds, such as with today's NE direction). Swimming and Surfing within 200ft of the north side will not be allowed if the NE wind has created a bad drift thru the pier. Surfing and swimming will be permitted on the south side of the pier where the drift pulls swimmers away from the pier and provides an easy spot for surfers to paddle out. So how do surfers and swimmers cohabit in the same space? As pointed out to me, the surf was big enough that the surfers were riding the outside and middle breaks and the swimmers were way inside. Lifeguards then expect swimmers not to swim out among the surfers and don't want the surfers riding all the way in among the swimmers. The lifeguards will be too busy to cite all surfers violating the rules, just the ones that pose the most danger to others. One example... an obviously experienced surfer paddles out on the north side on a NE day like today, just to get the super escalator to the outside and may allow himself to get sucked out thru the end of the pier, winding up on the south side. Very doubtful that the lifeguards are gonna whistle this guy in. Another example... on tiny 1ft waves in the middle of the day when the surf is full of swimmers, a longboarder continues to cruise thru the swimmers. Lifeguards will most certainly whistle in the surfer and give initial warnings... then see what happens next. I'd rather not have any surfing restrictions at the pier, but looks like I can still jump on those NE rights or SE lefts when I want to. And, don't forget that the pier surf area is "unguarded" for an early or late session.